On the day of Katherine’s 22 wedding anniversary, she walks into her kitchen and smiles at the bouquet and note left for her by her husband, James. He obviously has some sort of surprise for her. He does. He is leaving her for his pregnant girlfriend. Katherine is stunned. She takes a few days off of work to make her self presentable and stable enough to be able to tell people what happened. She goes back to work and with the help of her friends (friends that she had neglected during her marriage), she slowly starts to rise above the grief. When someone suggests a home exchange, she finds a house in France with a couple who would like to stay at her house in Canada. She heads off to France for two weeks, unsure of how she will do traveling along. There she finds gorgeous countrysides and friendly people. She makes friends, eats well, and explores the cities. She has a blast and when given the opportunity later, heads back again for a longer three month stay. Through it all Katherine learns to be herself again, to trust again. The Promise of Provence is filled with descriptions of luscious French countrysides, lifestyles easy and laid back with long conversation filled meals. It is a happy feel-good book. One that makes you want to hop on the next plan to France! **Disclaimer – Amazon links are affiliate links. Thank you for clicking through and helping to support this blog. This books sounds lovely…we have just returned from a trip to the south of France and Provence was my favorite spot..
Pam, what a pleasant surprise to find your review! I’m glad you enjoyed spending time in the south of France with Katherine! 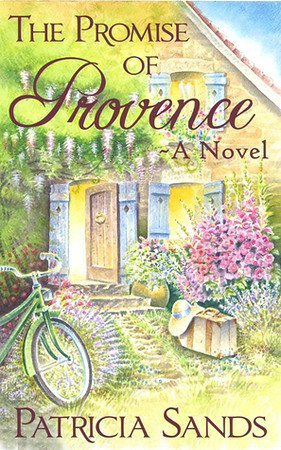 Thanks to tremendous reader response to The Promise of Provence, it has become Book One in the Love In Provence. Book Two, Promises To Keep, continues Katherine’s adventure and the ebook has just been published. Hopefully, we will have the print copy ready by the end of November. There are four more books planned in the series and I’m very excited about the way the story is unfolding. Writing fiction is a lot of work but also a lot of fun! I have been longing to go to France for some time now and would truly enjoy a book like this. Wouldn’t it be great if everyone could have such a happy healing experience after a divorce? Sounds like a great read, Pam. Oh, you would love it!